Teens struggling with deep personal issues can often make dangerous changes in their everyday life including mild eating disorders. An eating disorder is defined by abnormal eating habits (either eating too much or not enough) that often result in the deterioration of an individual’s physical and mental health. Eating disorders stand in the way of maintaining a healthy mind, body, and spirit. As a residential treatment center, Liahona Academy assists teens struggling with mild to severe eating disorders and can help them learn healthier ways to cope with difficult situations or issues in their life. Call Liahona Academy today at 1-800-675-8101 to find treatment for teens struggling with mild eating disorders. Anorexia: Teens who struggle with anorexia are depriving themselves of food and, therefore, the proper nutrition needed progress in everyday life. Those who suffer from anorexia usually starve themselves because of their desire to maintain an unrealistic and unhealthy body image. Starvation can lead to damage to vital organs like the brain and the heart. Other parts of the body start to become brittle like hair, nails, bones, joints, muscles, etc. The sufferer will often experience fatigue, dizziness, and fainting. Bulimia: Troubled teens that suffer from bulimia move through cycles of eating large amounts of food and then not eating at all. Individuals with bulimic symptoms will eat a large amount of food in a short time, and then try to rid their body of extra calories obtained by excessive exercise, laxatives, and vomiting. In between the binging, they will often skip meals or eat very little. This eating disorder can result in irritating inflammation of the esophagus, swollen glands, abnormal bowel functions, damaged gums and teeth, and sores in the mouth and throat. Binge Eating: Binge eaters are usually overweight and more susceptible to serious medical problems such as obesity. After time, teens struggling with binge eating can develop diabetes, high cholesterol, high blood pressure, heart disease, gallbladder disease, etc. 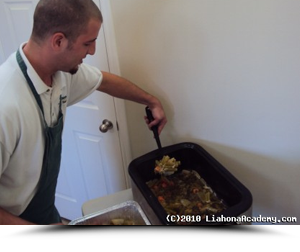 Liahona Academy is a residential treatment that offers special, supervised programs to teens struggling with mild eating disorders. Research shows that those who are suffering from eating disorders that obtain early and adequate treatment are more likely to have the best outcomes. We help teens with mild eating disorders discover healthier ways of coping with personal issues and how to properly to take care of their body. If you know a teen that is suffering from the effects of mild eating disorders, call Liahona Academy today at 1-800-675-8101 for advice and treatment options.